myWAPPS enables you to view real-time estimates of your factor level at any time, online or offline, based on your individual pharmacokinetic (PK) study. 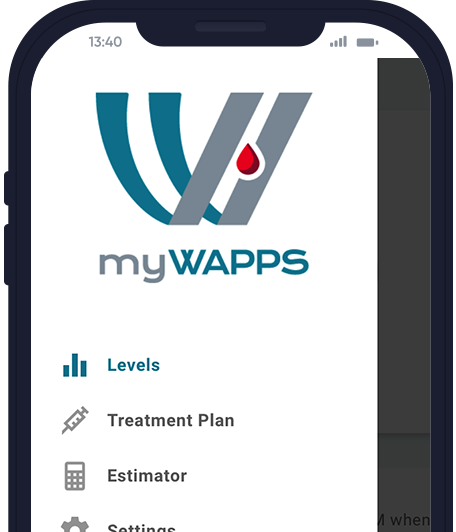 Your personalized PK information in WAPPS-Hemo is linked to myWAPPS by a healthcare professional at your hemophilia treatment centre, and your treatment regimen is set using the WAPPS-Hemo clinical calculator. myWAPPS also comes with an estimator function that allows you to see the forecast of your predicted factor levels. Register your last infusion and read your current factor level: Now you are all set! For myWAPPS to estimate your factor level, you need to record each infusion as they are performed. When your next infusion is due, myWAPPS will send you a reminder. You can also see your estimated future factor levels! Select the Estimator tab in the main menu, and use the scroll bar to see your predicted level at future points in time.